I’ve included a picture which shows what as an example the sdcard contents should look like. Basically you can see the kick_31.rom there and the wb3.1.hdf at the bottom. If you are making a bootdisk for gaming or demos, you dont need the wb3.1.hdf. 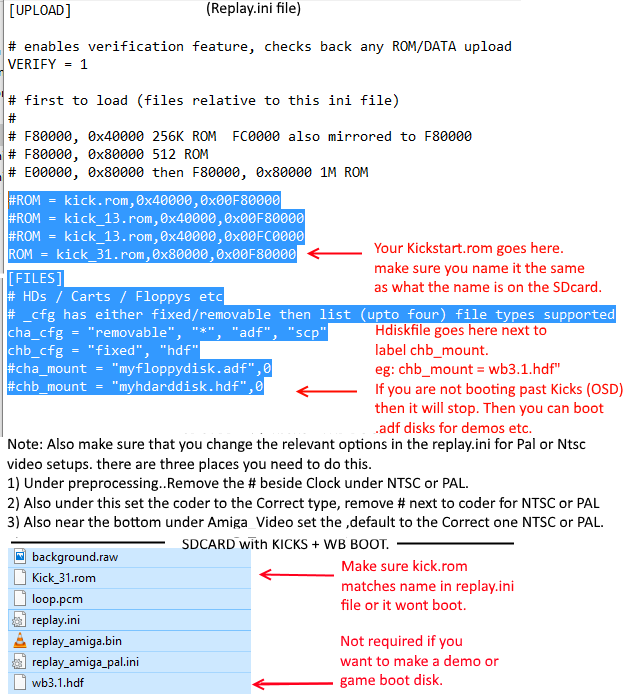 Now assuming that you have copied your wb3.1 roms onto the sdcard or and your wb3.1.hdf, and the contents of the Amiga.sdcard which you will download from the website see further below, You just need to make sure that in the replay.ini file, that you rename your kick3.1.rom so it reflects the same naming otherwise it wont boot as shown below. See this picture attached as an example. obviously you need to follow the bottom steps to go on and create a proper working workbench set of disks which you will install complete. There’s more examples on setting up a vanilla SD card in the forum. The replay comes pre-flashed but if you run into trouble you can find info on how to re-flash your board and repair a non booting board here. This can be updated by using the App there and running it from the OSD menu. Assuming you have setup winuae on your pc etc. Also note, make sure you have the complete set of 3.1 disks on sdcard. Create a 500mb HDF with a rigid disk block in WinUAE. Next, booted on the fpgaarcade into OSD with a default replay sdcard and then loaded amiga 3.1 workbench. Next, loaded extras from osd and went to hdtoolbox. Then, Created partition(s) dh0/dh1. Changed max transfer to 0x1FE00 to stop write or read errors oddities both partitions. Put back sdcard in pc and selected to add hdf from sdcard and rom in winuae. Next, Selected to Mount wb3.1 workbench & extras then start and went to workbench desktop. Next, I formatted the new dh0/dh1: with workbench quick format + renamed. Next, I installed complete 3.1 onto new hdisk from extras hdinstall. Next, now put sdcard back in replay. Reboot and if all works, it should boot straight into workbench.